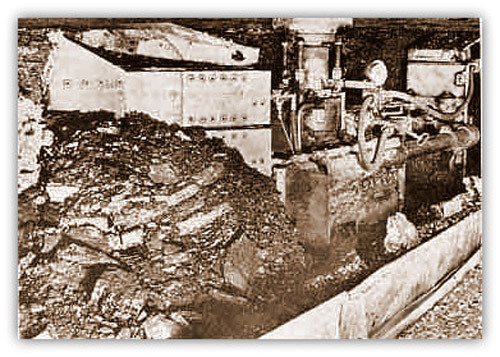 German Lobbehobel coal ploughs or planers were introduced into the Deep Hard seam 300s panel at Pleasley (Derbyshire) in 1952, bringing the first armoured face conveyor and prop free front. Schwartz props and GHH bars were used on these ‘Schnellhobel’ faces. Powered supports and advanced stable holes at the gate end were required to house the machinery. 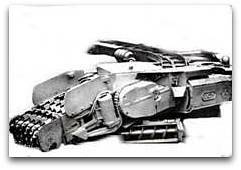 An engine hauled a steel rope with the cutting device attached along the coalface and ‘planed off’ a few inches (cms) (centimetres) of coal which dropped onto the panzer conveyor. Anbauhobel coal plough was installed. 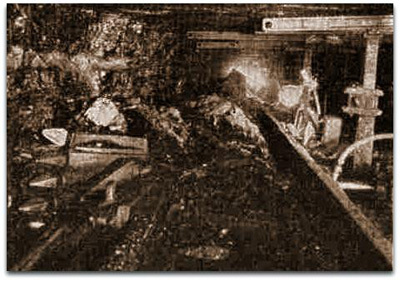 A Schnell Hobel was installed on a 230 yards (210m) long coal face in the Deep Hard and could take 30 cuts a shift of 2 inches (0.05m) at a speed of 72½ feet (22m) per minute giving 6 feet (1.8m) advance per shift. Charlie Hall the Undermanager took great interest in the project and was presented with a plaque later, following the relative success of the working. 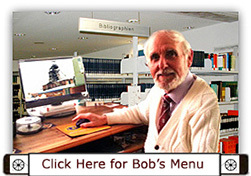 It is kept at the Pleasley museum. 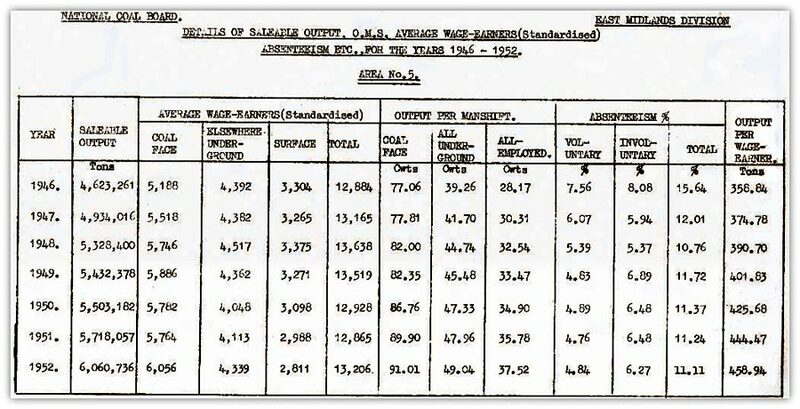 Under-officials were now placed on a weekly wage from August 1952. Overmen, Deputies and Shotfirers were graded into classes. The Mining Examinations (Deputies) Rules 1952 were introduced, which required that there was a practical and an oral test for Mine Deputies certificates. Fire retardant materials began to be introduced and timber was treated. The photo shows treated covering boards in an arched roadway. It would still be a few years before metal corrugated covering sheets were introduced to replace these covering boards. The highest ever manpower at Blackwell A Winning reached 1,342. 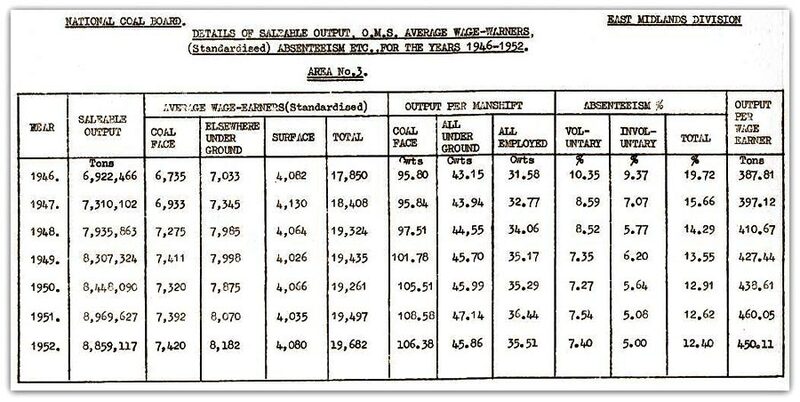 Highest ever output at Wingfield Manor was 394,111 tons, with 587 men. Denby Drury Lowe record weekly output reached 8,140 tons w.e. 21st Mar 1952. The Low Bright seam was re-opened at Newstead (Nottinghamshire) and worked until 1954. F Donald Severn (977) Sub-Area Manager was appointed Production Manager at No4 Area HQ Huthwaite, replacing Major FMT Bunney (2760), who transferred to No6 Area HQ Bestwood. 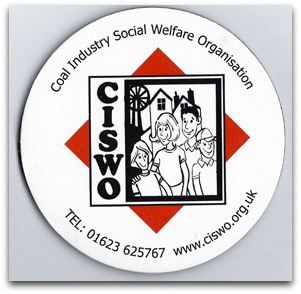 The Coal Industry Social Welfare Organisation (CISWO) was established in 1952 to promote and improve the health, social well being and conditions of mine workers, former mine workers and their families. Previously from 1921 to 1952, miners’ welfares were financed by output and royalty levies and run by the Government-appointed Miners’ Welfare Commission which included owners’ and union representatives. 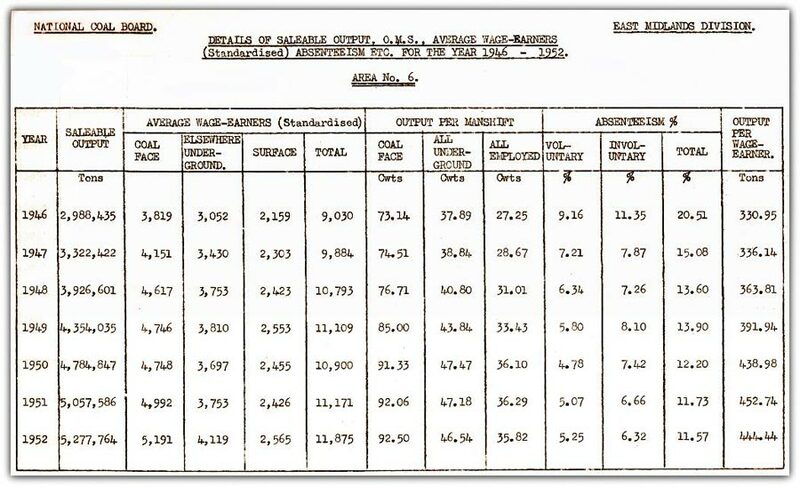 The NCB took over these responsibilities in June 1952 when the Miners’ Welfare Fund was wound up and the output and royalty levies ceased. Social welfare, includes clubs, sports grounds, community and holiday centres, Welfare schemes and non-vocational education now financed by a yearly grant from the Board to CISWO, which is managed jointly by the Board and the Unions. Scholarships for miners’ children, coalfield and national sports events, brass band championship and adventure courses are among the many events staged by CISWO. The activities in the North Derbyshire, South Derbyshire, Nottinghamshire and Leicestershire Coalfields were administered from the Welfare Offices, Berry Hill Lane, Mansfield. The Coal Industry Housing Association (CIHA) was set up in April and later there would be many houses built in the area, for example at Welbeck Colliery Village (now called Meden Vale) and Ollerton / Boughton (referred to as the ‘Reservation’, by the locals), to house families drafted in from the North as their pits closed down. The housing opposite Gedling colliery was referred to as the Concrete Canyon. 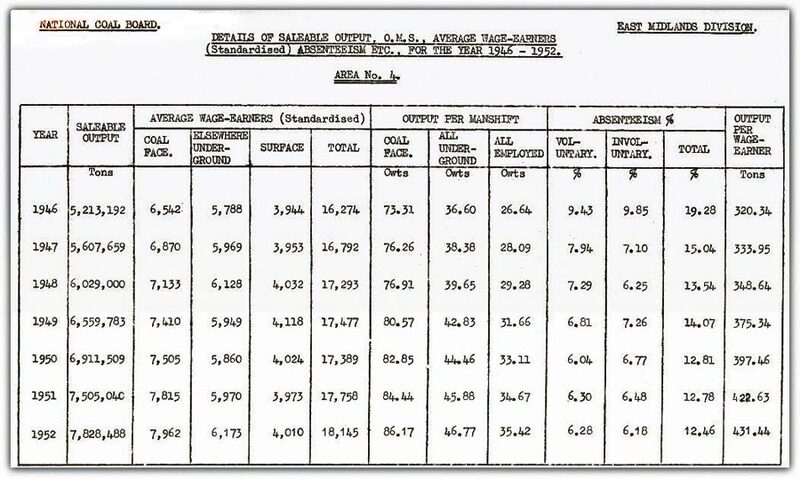 The National Coal Board took over Opencasting in 1952 and formed Opencast Executive to be responsible for opencast coal mining in England and Wales. Many opencast sites were in Derbyshire. A new Mines Rescue station was opened at Ashby de la Zouch in 1952 to replace the original one of 1913. The mines of South Derbyshire and Leicestershire were covered by this station. Gedling colliery football club won a host of trophies in 1952. A crowd of around 8,000 saw Gedling win the Nottinghamshire Senior Cup by defeating Sutton Town at Meadow Lane, Nottingham. They had previously been champions in the Nottinghamshire Alliance Division 1 for a number of years. They also entered the English FA Amateur Cup. 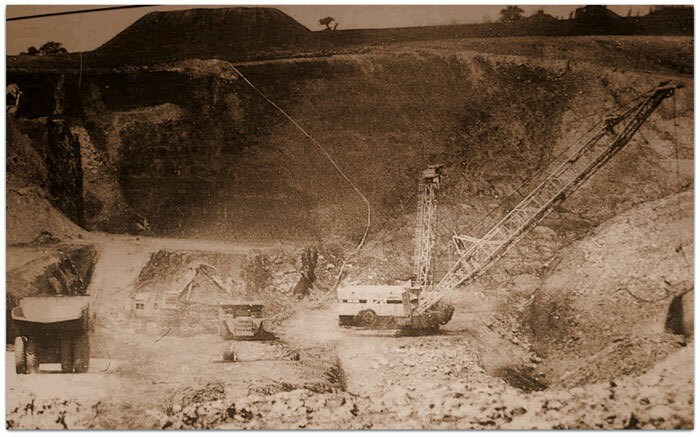 A JCM (Joy Continuous Miner) header was introduced at Donisthorpe (Leicestershire), followed by a longwall face Dosco Continuous miner. 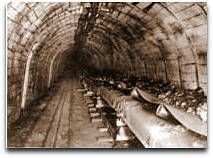 A major reorganisation had been carried out during 1951/52 and the endless rope system of coal haulage was changed to conveyors. An AB 60hp multi-disc coal cutter with modifications was tried at Annesley (Nottinghamshire) from Jan to Aug 1952. The coal was loaded onto a Huwood PY30 armoured python conveyor. The face team required 9 men – driver plus assistant driver, 2 timbering, 2 snaking the conveyor, 1 drawing off and 2 men in the LH stable hole. The 50hp prototype model had been tried at Silverhill (Nottinghamshire) in 1951 in the Yard seam but the gradients had proved too steep. 7 Samson Stripper machines at Clipstone, Rufford, Thoresby, Brookhill and Whitwick Collieries. Huwood Loaders at Pleasley and Silverhill Deep Hard seam. Handfilling onto a flexible armoured face conveyor carrying a coal cutter tried in Stockings seam at Donisthorpe. Another installation was at Gedling Top Hard. 60 Meco-Moore Cutter Loaders (43 low type and 17 high type), a shallow cut Meco-Moore installed at Desford; at Thoresby a Meco has been modified to turn round quickly enabling 2 shifts per day working; M and C Strippers, First Coal Plough at New Hucknall (1950/1951) and an improved Loebbe Hobel plough at Pleasley Deep Hard taking a 3" strip at 75 feet per minute, AB Lambton Flight Waffler at Brookhill, AB Trepanners at Coppice in Piper seam and at Mansfield in Hazel seam, Multi -disc cutters in Deep Soft at Babbington and Annesley, Room and Pillar working 3 using Duckbills, 7 using 8 BU Joy Loader, 3 Continuous Miners at Donisthorpe in Stockings seam, one installed at Denby Hall and 8 rooms loading by hand onto chain conveyors, (total of 26 armoured conveyors (8 German made and 17 British)...Total output for the East Midlands Division for 1952 was 5,154,168 tons as compared with 4,528,283 tons in 1951. The Slusher or Scraper bucket for stowing of ripping dirt was developed at Shirebrook and at the end of the year 43 were in operation within the Division. 15 Gum stowers consisting of a paddle attached to the coal cutter that projects the undercut dirt into the goaf or gob are in use. Pneumatic stowing of washery dirt and pit refuse used in conjunction with a Continuous Miner at Donisthorpe and another at Bentinck. However the cost was high. 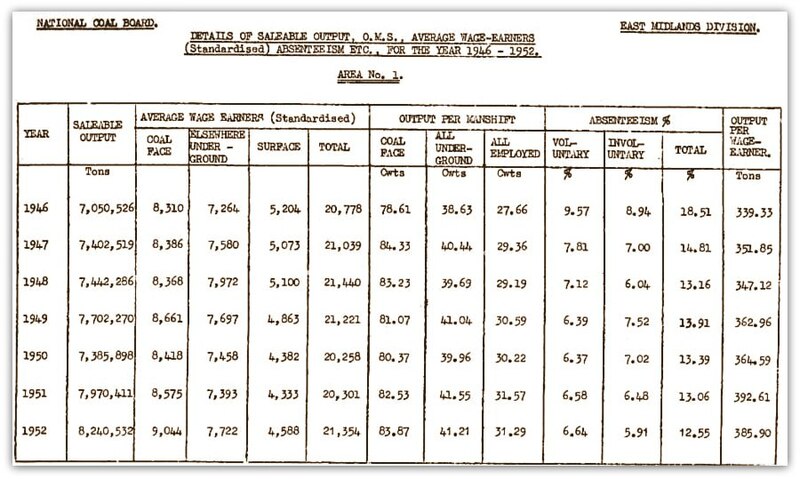 The number of hydraulic props increased in 1952 from 38,831 to 63,818. These props are quickly set and equally quickly released. Some have oil medium and some have water. Slide bars incorporated with hydraulic props providing a prop free front pioneered at Gedling. A number of German mechanical yielding supports are in use. During 1952 a dozen different types of fireproof PVC conveyors in use in conjunction with standard rubber belting. Stone loading machines in use included 8 Eimco Finlay Loaders, 1 Sullivan HL 20, 22 Slushers (but not Shirebrook type), 27 Duckbills, 2 Joy 8 BU 2,12 Joy 8 BU 3, 50 Joy 8BU 4, 14 Joy 12 BU and 25 M and C 2 machines.